When Riley kids grow up, it is interesting to see where life takes them. Meet Grace Kestler. 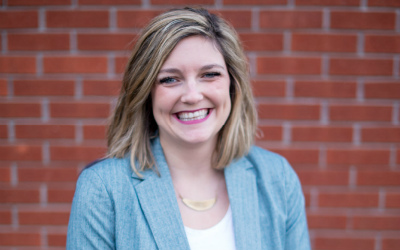 She is a DePauw University graduate, a self-proclaimed foodie, founder of her own consulting firm and is currently a city council candidate in her hometown of Columbus, Ind. Learn even more about Grace is this fun Q&A! Q: Tell us about your experiences with Riley? What impact has it had on your life? A: I’ve been involved with Riley in one way or another for more than 25 years. I was diagnosed with Muscular Dystrophy when I was two and moved to Indiana when I was five. I visited Riley Hospital for Children on a yearly basis and had one surgery when I was younger. I remember the kind nurses and doctors who consistently made sure patients felt at home, even though it is a hospital. It is a wonderful place that allows kids to be kids while their going through a difficult time. I also attended Camp Riley for 10 years and became a counselor there for two years. Camp Riley really pushed me to be independent and experience the outdoors just like every other kid. It is also a special place where I met some of my life-long friends. I’m still involved with Camp Riley as mentor for the Venture program. I’m so honored to give back to a place that did so much for me growing up! Q: What made you decide to run for Columbus City Council? A: I’ve always been involved in my local community and am passionate about helping people. I love being engaged in the community that I live in and try to give back as much as possible. Columbus is where I grew up so it holds a special place in my heart. I want to be a part of supporting its growth and development for future generations. I also believe we need diverse representation within the city and government to ensure all unique voices are heard. So, as a young, female candidate with a disability, I feel that I could provide an interesting perspective to local issues. Q: What is something fun about yourself not many people know? A: I lived in Germany for three years! I moved to Berlin not knowing anyone to get my masters in Intercultural Conflict Management. I did research with refugees living with disabilities in the city and focused on integration services for these individuals. I was also a professor at a university in Germany for 6 months. While living there I traveled to 13 countries, including India. A: While growing up with a disability has been difficult at times, I’m thankful for the experiences that I’ve had and people that I’ve met because of it. I’m so thankful places like Riley Hospital for Children and Camp Riley that empower children to be their strongest selves and pursue their dreams. Camp Riley is made possible through the generous support of Riley Children's Foundation. Donations ensure that no camper is turned away due to financial need. Click here to learn more.